This is not the flimsy magnet paper sold in office supply stores (most of which is made overseas). This product is strong, sturdy and 100% Made in the USA. Please note that the half Glossy/half Matte option is not another finish. By selecting that option half the sheets in your order will be Glossy and the other half will be Matte. Will this work in all inkjet printers? No, it will not. This product is heavy and not all inkjet printers can pull the material through (although the VAST majority can). Printers that pull the material straight through (rather than those that fold the product back over itself while printing) will have the best success. Most all-in-One printers have trouble pulling this material through as well. Please try a small quantity of this product first to see if it will work in your printer. Returns on this product are subject to a 20% re-stocking fee. Please don’t email and ask if this product will work in your printer, every printer is different. This product is made exclusively for Magnet Valley. Print your favorite photographs, favor magnets, save-the-date magnets or advertisements for your business with these high quality magnet sheets. Do not try to print on these with a laser printer or copier, ONLY an inkjet printer!! Not for outdoor use. 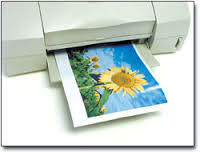 Inkjet Printable Magnetic Paper. Thin sheets of magnet with an inkjet printable surface.